One day in the Sabha of Srunjaya maharaja, Shri Naarada Maharshi was present. He was sitting on a Unnata-simhaasanam. Along with Srunjaya, many did puuja of the great Maharshi. One of the Vipras present asked Naarada Maharshi with Vinayam, “Muniidra! Maharaja is a good person. 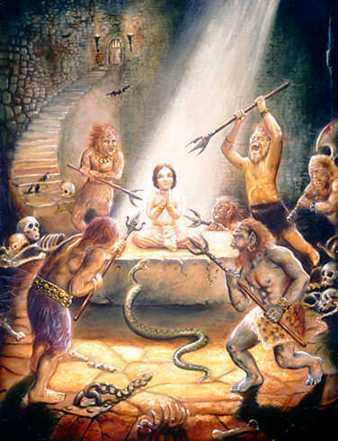 Dharmaatma. He is everytime busy with doing Anna-daanams. Having anugraham of great people like You too, why is he still having duhkham”? Naarada Maharshi asked “Is it? I didnt know. Maharaja! What is the reason for your duhkham? Why didnt you tell Me all this while?”. Srunjaya Maharaja replied “Maharshi! I want a putra who is a Gunavanta and Ruupavanta.”. “That’s all no”? asked the Maharshi. 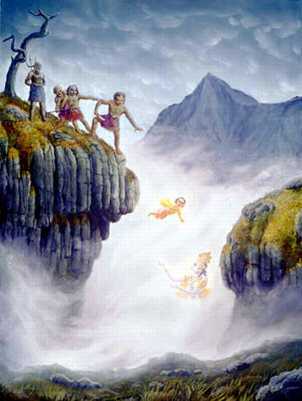 With Dhana-kaanksha and Duraasha, Srunjaya went on to say “Not only that. His Mala, muutra, sveda aadi (excretory materials from body) must become Gold”. Naarada Maharshi gave him the Varam and went away. Srunjaya became very happy. 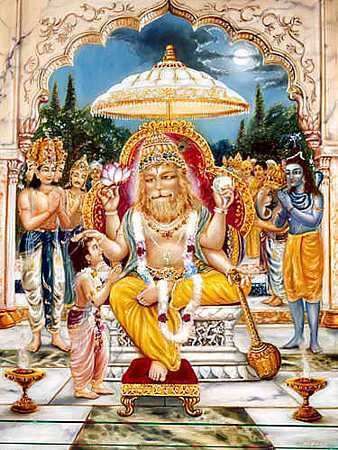 He named his putra “Suvarnashtheevi”. They started looking after the kid with great care. With the Gold got from Suvarnashtheevi, everything right from Anthahpuram to Paada-peetham was made of Gold. Some time passed by like this. “Maharaja! Will your putra now come back, even if you cry? It is not possible to go against Kaala-gati. Sat-sheelam, Keerti are permanent not Shariiram. You wanted a putra who has Sadgunam and Ruupam. Till that it was fine. But with Duraasha you asked for more. If a person has Duraasha, the end will be like this only” said Naarada Maharshi. Then Naarada Maharshi told stories of Marutta Maharaja, Angaraaja, Shibi Chakravarti, Shri Raama Chandra, Bhageeratha and other such great people’s stories. 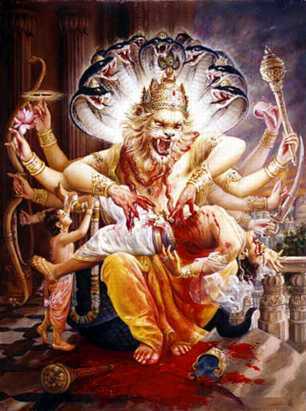 Srunjaya then said “Maharshi! I became dhanya listening to stories of these Mahapurushas. I became a Nirmala-hrudaya”. Pleased, Naarada Maharshi said “ask Me what Varam you want”. Srunjaya replied “Deva! Your anugraham is alone enough. I dont need anything more“. Happy with the King’s reply, Naarada Maharshi brought Suvarnashtheevi back to life and went away. Duraasha always leads to difficulties. Though Srunjaya was King and was ruling this entire Bhuu-khandam, he was not satisified. Finally he had to repent for his mistake.